This weekend I ran my very first race – EVER! This race was the culmination of the past 10 weeks of running I have been doing. Back at the end of March, I began the Couch to 5K Running Plan. The Week 1 regimen was to do this: “Brisk five-minute warm-up walk. Then alternate 60 seconds of jogging and 90 seconds of walking for a total of 20 minutes.” Gradually, over 10 weeks, I increased my running time and distance, until I reached a point at which I could run three miles without any walking. I am still in awe that I could do this – I NEVER thought I would be able to, to be honest. I highly recommend this running plan. 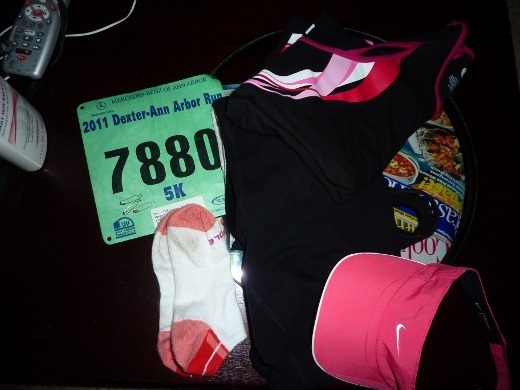 The night before my 5K (which is 3.1 miles, which I’m sure you knew, because I know my readers are smarties), I laid out all my gear. My timing chip was located on the back of my ‘7880’ number sign (is there a technical term for that!?). My alarm went off at 6:30 AM on Sunday, and I ate a small breakfast, and drank water. 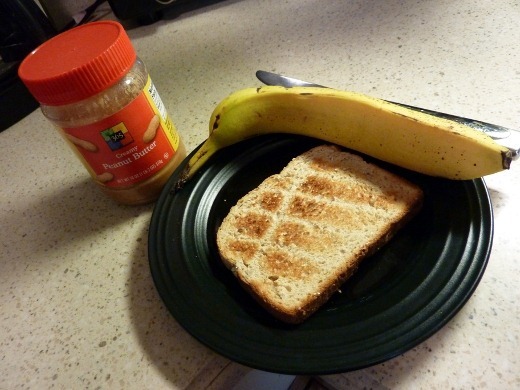 I did as one of my favorite bloggers does, and made whole wheat toast with peanut butter and banana slices. 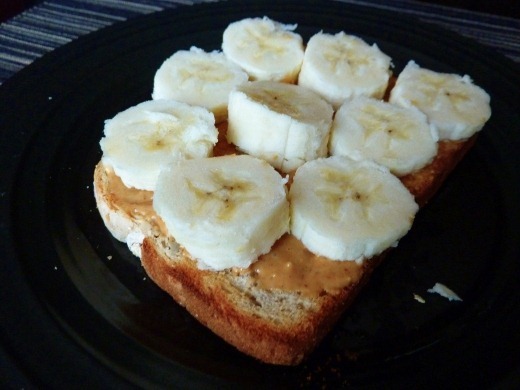 Got my easy-to-digest carbs and protein, right? After leaving the house around 7:15 AM, we headed downtown to park, but had trouble finding a spot in the suggested location (Ann & Ashley parking structure, which was FULL and had no sign indicating it as such! ), so I ended up having to hop out of the car to catch my shuttle bus to the start line (with no cell phone, keys, or idea of where the car was parked, mind you), while the huz drove off to find parking. I didn’t have to wait long to board my shuttle from downtown which took me to the start line, near Forsyth Middle School. Once there, I had about 25 minutes to wait in the bathroom line, people-watch, and explore, until the crowd started to make its way over toward the start line on Newport Road. No one really seemed to be lining up by pace, so I just tried to find a nice relatively non-packed area to wait, away from slow-looking people or people who looked like they would be running in a pack together. I was probably in the first 1/3 of people away from the start line, lined up with around 1700 other runners! A few minutes before the horn blew, Superstar by Lupe Fiasco started playing and it’s been in my head for two days straight now. Before I knew it, an announcer began telling us we were 4 or 5 minutes from GO TIME, which was 9:00 AM! I was hugely adrenaline-pumped butterflies-in-my-stomach at that point! The past few weeks, days, and hours leading up to this run I had been far more nervous about the logistics of the race (parking, what to do with my chip, getting to the right place on time, etc.) than for the actual run itself, but I was pretty amped up at that point. After what felt like 60 seconds later, the squeaky horn blew and the crowd began inching forward. Once I crossed the rubber mats, my chip started timing me (or at least I hoped it did!) and it was GO TIME. There were two mats, maybe 8 feet apart, at the start line and I didn’t know, and still don’t know which one was the actual start line! But I started running after the first mat, and hit the “START” button on my watch. At first there was lots of weaving in and out of the crowd, with the runners generally moving toward the left side of the street to pass, and the slower runners or walkers off to the right side. I was a tad irritated by some of the walkers at the start of the race. I feel like if you know you will have a slower pace, and will be walking the whole race, that you should position yourself toward the back of the large queue, rather than toward the front where all the runners have to weave around you. Okay, rant complete. Overall, most of the race participants seemed considerate of others. Luckily, there weren’t too many walkers in my way. I passed lots of people, and lots of people passed me, but I was internally laughing at some of the people sprinting past me, thinking, “oh, I’m SO going to pass you around mile 2!” Muahaha. In what seemed like no time flat, I encountered my first turn, onto Bird Road, a rather scenic road, which I knew would turn to gravel about halfway down. There were two STEEP hills going DOWN on Bird Road, the first of which was paved, and the second of which was gravel. I was ready to heave-ho down that hill, but I had to be careful and watch my footing so I didn’t faceplant. There was definitely a bit of a bottleneck on Bird Road, with lots of people making risky weave moves through the crowd, and around a random car that was in the road! Minutes later, I made my second turn, onto Huron River Drive, and soon reached the one mile marker. I glanced down at my watch and it said 9:17 – I was making good time! However, I knew the first mile would likely be my fastest since it was mostly downhill and knew the end of the race would be uphill. At that point, I really started to focus on falling into a steady pace. The crowd quieted down dramatically, and there was much less weaving in and out. The portion of the race along Huron River Drive, which as you may guess, is along the Huron River, was my favorite part of the race. It was very peaceful and shaded, with lots of trees lining the road, so not too hot. 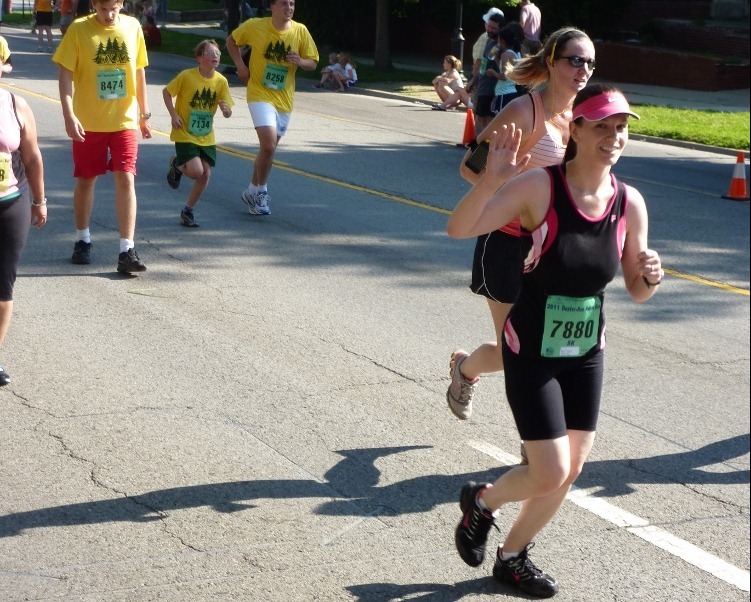 As we reached the end of the Huron River Drive stretch, before merging onto Main Street, there was a rather steep uphill that I dominated – running the whole thing. After reaching the top, nearly half of the people around me started walking, and I passed what felt like a ton of people at that point. I felt triumphant! I conquered that hill like a ninja. Not long after merging onto Main Street, I passed the two mile marker, at which point there was a water station that I bypassed and someone spraying a fountain of water in the air with a hose that I shimmied my way on over to, which felt amazing. I was so distracted by the water fountain that I didn’t really peek at my watch at that point. A few minutes later, after the water evaporated from my skin, things got really tough. My watch said I was 25 minutes into my run and the heat was becoming extremely intense. The final stretch of the race, up Main Street, was nearly completely unshaded, with the sun beating down even at 9:30 in the morning. It was rather muggy and the temperature was approaching 80 degrees. I must admit my last five minutes of the race were grueling. The last half mile of the race is uphill, and with the sun beating down, I was struggling. Being surrounded by runners in the same boat as me, and being cheered by the spectators were two factors that helped keep me motivated. At one point, at around 27 minutes, I told myself I needed to take a one minute walking break, and started to walk for maybe 4 steps, and then completely changed my mind, reprimanded myself, and told myself that I would force my body to run this entire thing, no matter what. In my training, I hadn’t yet run a full three miles without a couple brief (30-60 second) walking breaks, but I really wanted to run this whole race. When I run, I often repeat mantras to myself – that I am lucky to have a healthy body capable of running this race, and that my body IS capable of doing this run, I just have to BELIEVE I can do it. The Finish – 3.1 Miles! As I was physically and mentally struggling, I soon saw a balloon arch at the top of the hill I was running up! The finish! There was no turning back now – I had to run run run. 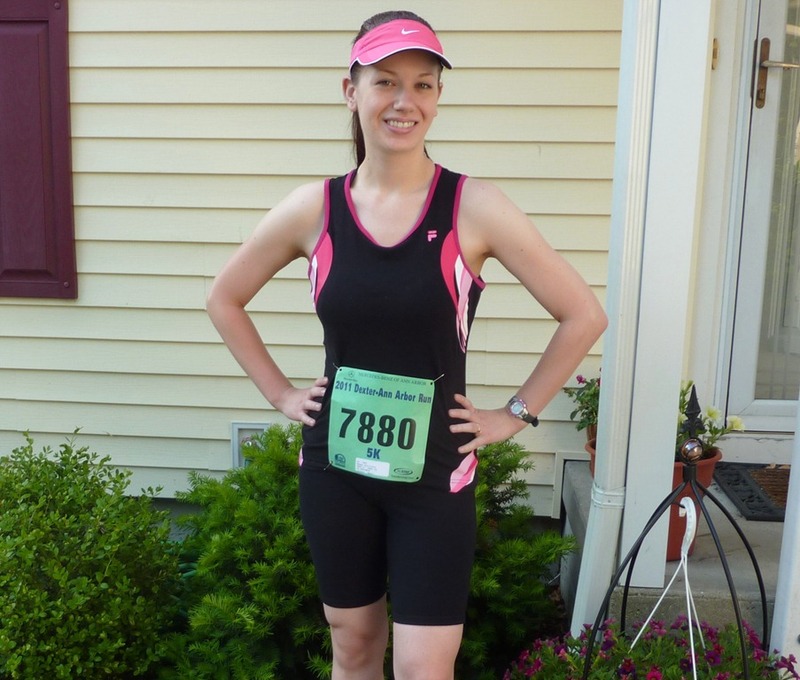 I started feeling great, despite my physical struggle – I was REALLY going to do this thing! I really started giving it my all, running up that hill, in the sun, and then reached the big balloon arch, and realized – OH SHIZ! This isn’t the end! One of the spectators hollered to one of the other runners, “keep on goin’!” My ninja moves had been hoodwinked! I still had another block to run, and MY GAWD it was brutal! But nevertheless, I kept putting one foot in the front of the other, and willed my body across the finish line! As runners crossed the finish line, our chips were being registered, and an announcer said my name over the loudspeaker. YES! I downed a water bottle in two minutes flat, and physically recovered for about ten minutes before my runner’s high kicked in! I made my way over to the meeting spot I had set with Tom, feeling like a badass. I actually did this; I ran 3.1 miles, when, a few months ago running for sixty seconds was a challenge. I felt, and now feel, like my body is more capable than I thought and that I have a stronger mental confidence than before I started running. Does that make sense? Makes sense to me. Once I found Tom, he was with his co-worker who had also run the race. 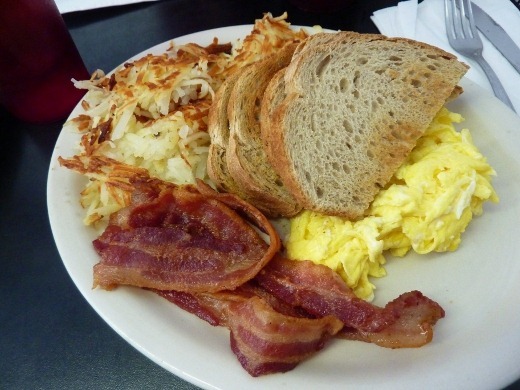 Food was the furthest thing from my mind, while caffeine and ice were the primary things on the brain; however, I went with Tom’s suggestion for the three of us to head over to Fleetwood to get breakfast, since he’d sacrificed precious weekend sleep in exchange for race spectating. I truly wasn’t hungry, but figured I would be eventually, so I ordered some food and ended up eating about half of this plate, and downed a second bottle of water and a giant iced tea with breakfast. In my division (females age 25-29) I came in 50th place out of 139 runners. Out of all the females who ran, I came in 308th place out of 1074 runners. Out of ALL the people who ran the 5K, I came in 696th place out of 1784 runners. I am very pleased with my results! My primary goal was simply to finish the race and run the entire time, which I did, and I am thrilled by my average 10:17 mile pace! Running the race was a great experience – I’m very happy I did it! I was impressed by the overall organization of the race and would love to run again next year. I’m now really eager to run another race! By mid-afternoon, I was STARVING! 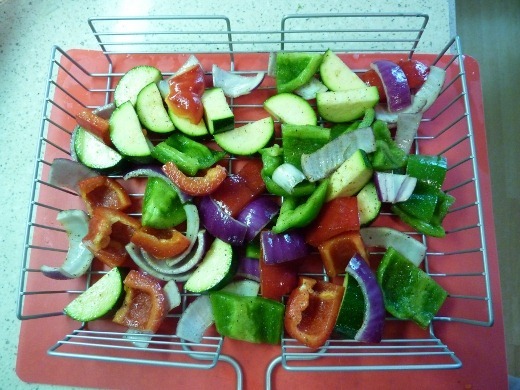 We had a grill-feast planned for dinner, and threw all these veggies, which I chopped, tossed in EVOO, salt and pepper, Old Bay, and garlic powder, into our new veggie basket for the huz to grill about 10 minutes before our chicken was done on the grill. 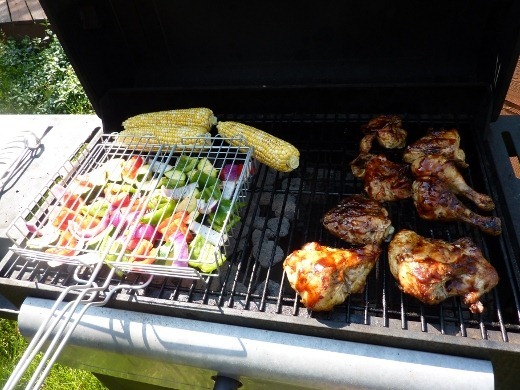 We also grilled corn on the cob, which was brushed with olive oil and sprinkled with salt and Old Bay seasoning. I cannot express how delicious this meal was (nor can I figure out why this picture turned out so terribly! I think one of the settings was off! 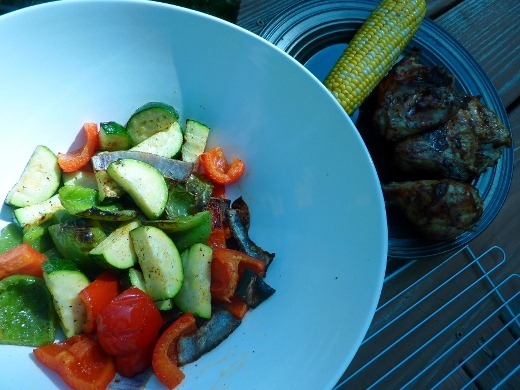 )!Grilled vegetables are the best!!! And Tom did a nice job on the chicken – it was delish. 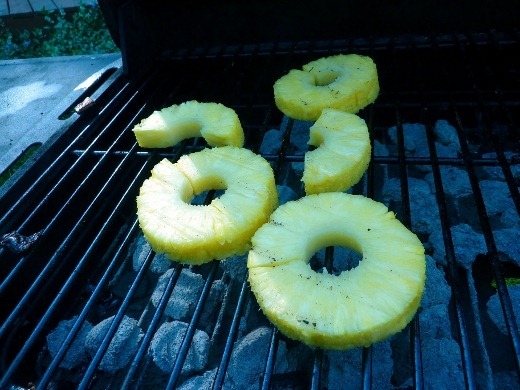 For dessert, Tom attempted to grill pineapple that I had sliced, but we didn’t quite achieve the char I was desiring. It was still tasty though! Warm, sweet, and smoky. It’s amazing how long Sunday felt! Crazy how getting up at 6:30 AM on a weekend can make your day so long. I felt like I accomplished so much yesterday! Congratulations, Megan! You have really outdone yourself! Way to go! Pingback: CSA–Week 1 « Meg.Goes.Nom.Nom. The “number sign” is called a “racing bib”, “running bib” or “bib number”. Oooh! Thanks for the tip! Next time I will be a true professional with my “racing bib”! Pingback: CSA Week 2 « Meg.Goes.Nom.Nom. Pingback: I’ve Got Gadgets & Gizmos (And beans) A-Plenty « Meg.Goes.Nom.Nom. Pingback: Big House Big Heart Recap 2011 « Meg.Goes.Nom.Nom. Pingback: Couch to 5K Again? | Meg.Goes.Nom.Nom.